Beginning in 2003, Spalding DeDecker (SD) has performed annual vertical measurements for subsidence monitoring. Elevations are measured in relation to the provided benchmarks. Site benchmarks were established in relation to this master benchmark. SD re-establishes and checks the elevations annually for monuments and well heads on-site. Benchmarks were set consisting of highly-stable sectional monuments. The monument components were manufactured by Berntsen and consisted of stainless steel sectional rods driven to a depth of 10’ to 20’ using a gas-powered Pionjar rod-driving machine. The monument was isolated from surface movement using a greased sleeve and was protected with a security access cover. Baseline elevations are measured using a Leica NA2002 electronic level. The measurements are combined with interconnected level loops forming a vertical control network and were adjusted using Star*Lev least-squares adjustment software. Subsequent measurements are obtained at monuments and well heads. Results are presented in a report which includes copies of field notes, computations, photographs of each of the points, and a table summarizing and comparing the results from each year. 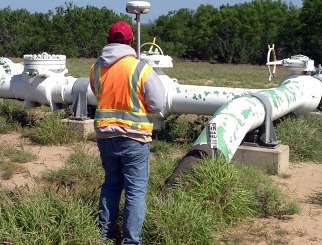 Because the various Marathon Ashland sites are subject to subsidence, the Owner(s) need to regularly study the status and have a monitoring program in place.